Take 2 sweet potatoes or yams, wrap in aluminum foil and bake in the oven on 400 degrees for 1 hour. Then peel and cube. (To steam the sweet potatoes or yams, peel and cube them, then steam for 20-30 minutes.) Puree sweet potatoes or yams in blender until smooth. Add water or breast milk to reach desired consistency. Core 2 Gala, Red or Golden Delicious apples, but leave peel on. Place the apples upright in a 9×9 baking pan filled with 2 inches of water and bake at 400 degrees for 40 minutes. Then peel and cube. (To steam apples, peel, core and chop them, then steam for 15 minutes.) Puree apples in blender until smooth. Add water or breast milk to reach desired consistency. Bake 2 zucchini with skin on at 450 degrees for 10 minutes on a baking sheet lined with aluminum foil. (To steam zucchini, leave skin on and cut into cubes. Place in pan, barely cover zucchini with water, and steam for 8 minutes.) Puree zucchini in blender until smooth. Add water or breast milk to reach desired consistency. Cut Butternut Squash in half and de-seed. Place cut-side down on a baking sheet lined with aluminum foil for 45 minutes at 400 degrees. (To steam Butternut Squash, cut in cubes and peel. Place in pan, barely cover Butternut Squash with water, and steam for 30 minutes.) Puree Butternut Squash in blender until smooth. Add water or breast milk to reach desired consistency. Thoroughly cleanse 4 cups fresh spinach and pick out damaged leaves. Steam in a steamer basket pot for about 5 minutes until leaves shrink and appear wilted. Drain water. Puree spinach in blender until smooth. Add fresh water or breast milk to reach desired consistency. Peel 2 whole carrots and bake on a baking sheet lined with aluminum foil at 400 degrees for 25 minutes. (To steam carrots, peel and slice. Place in pan, barely cover carrots with water, and steam for 25-30 minutes.) Puree carrots in blender until smooth. Add water or breast milk to reach desired consistency. Bake 2 ripe Bartlett pears on a baking sheet lined with aluminum foil at 400 degrees for 30 minutes. (To steam pears, peel and cube. Place in pan and steam for 10 minutes.) Puree pears in blender until smooth. Add water or breast milk to reach desired consistency. 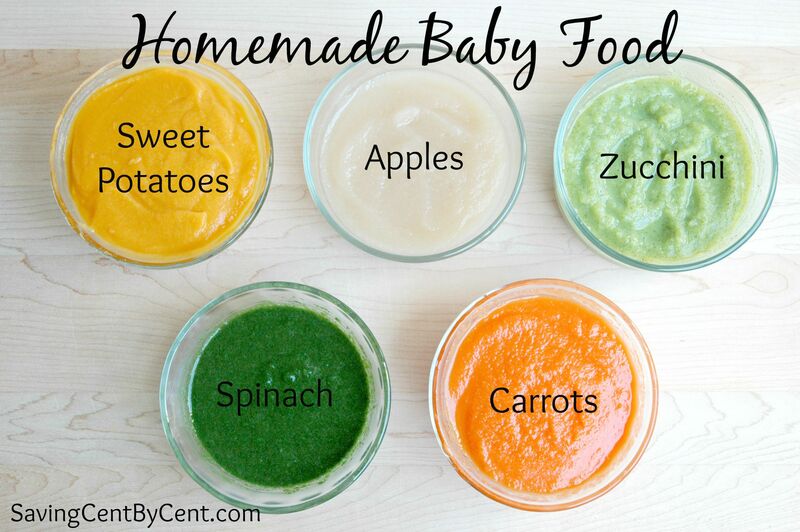 After you finish pureeing the baby food, place some in containers in the refrigerator until you are ready to use it within 1-2 days. 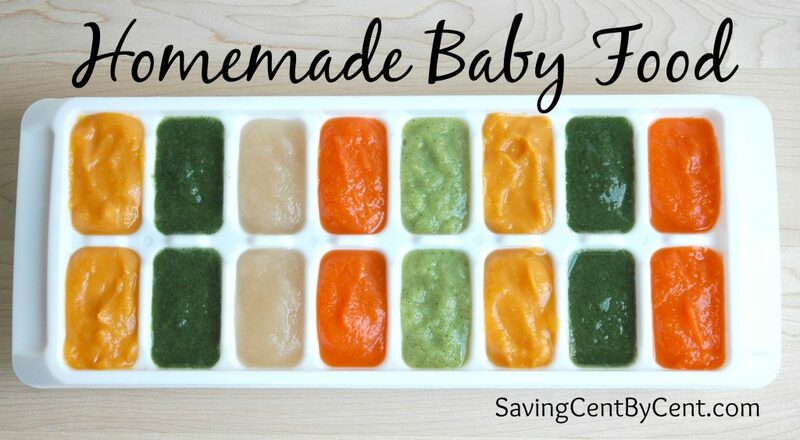 Freeze the rest of the baby food using freezer trays . Then take the frozen cubes and place them in labeled freezer bags for up to three months. I usually take cubes out of the freezer daily and place them in containers in the fridge and give them a few days to thaw before I use them. That way it’s ready for the baby to eat.